Exporter for FSQM Pro is a premium addon to the popular WP Feedback, Survey & Quiz Manager – Pro plugin. It adds the ability to exports reports to XLSX, PDF, XLS and/or HTML files. Also, it enables you to download the submissions under any form to a RAW CSV file for manual analysis. This plugin is not a standalone application. You’d need WP Feedback, Survey & Quiz Manager – Pro to use it. WP Feedback, Survey & Quiz Manager – Pro is a premium WordPress Plugin using which you can easily create unlimited nice looking tabbed or paginated or simple forms with MCQ and/or FreeType Questions with custom validation. All submissions are stored in the database for complete analysis. 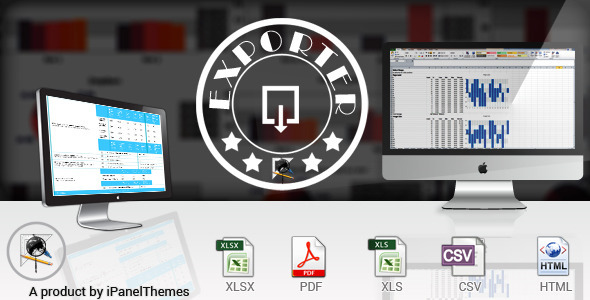 Export Reports: Extends the report functionality of FSQM Pro to export it in forms of XLSX, PDF, XLS and/or HTML file. The format is same as the original plugin. Charts are created dynamically for XLSX files which you can open in MS Excel 2007 or similar software. For the rest of the formats, charts are rendered to jpg files. Persistent Reports: When you create a report, the addon gives you an option to show it on your site as a persistent report. The advantage is, it will not query your live database and will save a lot of bandwidth. Export Submissions to CSV: If you are a stastistician, then you’d probably want to anaylyze the RAW data yourself. FSQM Pro stores all the submissions in a serialized format which makes it impossible for direct database exports. But with Exporter for FSQM Pro, you can easily export all the submissions in a properly formatted CSV file, where columns represents your questions and rows represents the submissions. Download Submission as PDF: Exporter for FSQM Pro further extends the functionality to give you and your users ability to download a submission in form of a PDF file. PDF Customizability: The PDFs can be customized very easily if you know a little bit of CSS. For your convenience, we even provided a template CSS to start with. Just change the color codes and you are done. PDF Extensibility: Furthermore, any PDF/HTML the addon generates will include the template you’ve provided. This ensures, you can brand almost every aspect of the output. Before purchasing, please make sure your server meets the following minimum requirements. WP Feedback, Survey & Quiz Manager – Pro, Version 2.1.6 or greater. The application has been tested on WordPress 3.5 to 3.6 and should work with all updated versions. We shall release updates and patches if anything is found not working. Due to extensive resource consumptions during exports, the plugin will require at least 256MB of memory. The more the better. Also, this will work only for WP Feedback, Survey & Quiz Manager – Pro, Version 2.1.6 or greater. You might need to update the main plugin before you wish to install this. Please refer to the working admin demo to see what exact features you will be getting before buying. If you think certain feature should be a part of the plugin but is not present, then you can open a thread on our Support Forum. If we see the feature is really important to the community, then we shall do our best to add it to the future version. Thank you for your interest in Exporter for FSQM Pro. The following Tools were used during the development of this project. PHPExcel: We forked PHPExcel to provide the XLSX, XLS, PDF and HTML downloads with customizability. mPDF: For generating all PDFs. jpGraph: For rendering all static charts. WordPress : The best platform ever.